Article first published as TV Review: THE TERROR on Seat42F. THE TERROR comes to television at a time when there are a great many “true story” dramas on television. Given that this show is about an actual boat, two boats really, called Terror and Erebus, that went missing in the Arctic Sea in the 1840s, it is a logical conclusion to make that the events portrayed actually happened, at least in part. Especially because quite a bit was found from these lost ships. However, the AMC series is not claiming to be true, nor does it take many of its cues from real life. It is an adaptation of a novel, also called The Terror, by Dan Simmons, in which supernatural horror mixes with reality. This historical fiction is meant to be a good companion for The Walking Dead, still the network’s (and scripted television’s) most popular show. Whether it’s scary or gory enough to run in those circles, well, you can make that determination yourself. The cast is headlined by some familiar faces. 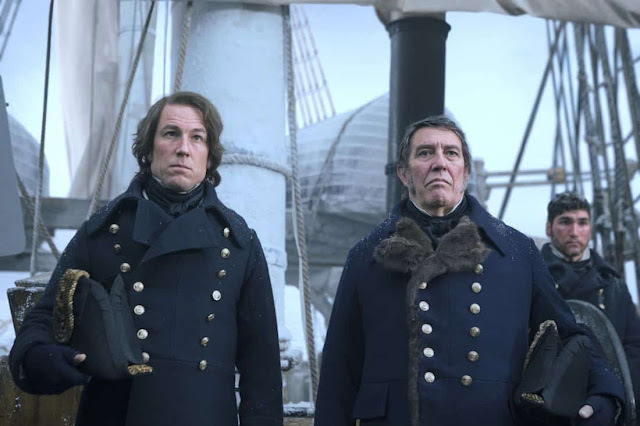 Ciaran Hinds (Game of Thrones) plays Captain John Franklin, the man in charge of the expedition, whose poor decision gets the ships stuck in ice before the first hour is over. He is assisted by a bunch of officers, primary first mate Francis Crozier (Jared Harris, The Crown) and second mate James Fitzjames (Tobias Menzies, Outlander). The show is slow to really distinguish many of the characters as individuals, but these three do lend it some heft that will buy the series some time to find its footing. Though I couldn’t tell you much else about anyone else in the cast. The tone of the piece is pretty cool. The cold is well communicated in both design and performance, likely to give some in the audience chills just from watching. There’s also an underlying feeling of dread from start to finish of the first hour, giving you chills of a different sort. The isolated, dark, desolate locale the ships are traveling through effectively sets the right mood. It feels like there’s always something lurking around the corner, like death could occur at any time. And it occasionally does. Without having read the novel, I do not know what is coming, other than that all hands were lost (going by historical events). Some people may be hesitant to get too attached to any of the characters, knowing their demise is certain. But without knowing who will go and when, THE TERROR is good at building tension, keeping you on the edge of your seat. Which is the point. THE TERROR doesn’t seem to have much of a mission beyond that. Since it’s a fictional take, it doesn’t inform the viewer. The pacing is slow and character development seems minimal. The focus is less on building a fully realized world and cast of characters than having some highly qualified performers fill screen time until the series gets around to killing them off. The names at the top of the cast list (the three above) are likely to be some of the last ones just for that reason. And that’s why I have trouble recommending THE TERROR. I enjoyed it, sure, and I may watch more of it simply because I like both history and the actors. But I don’t think the writers are really giving us a full story. It’s a valid choice to write for the situation, not the players, but it makes for a far less compelling narrative. Will anyone even care when any of the leads depart this life? I’m not sure. Other shows offer more, so that knocks this one down the priority list, even though it does expertly set a tone. THE TERROR airs Mondays on AMC.